Get ready to really make your audience think, as they try to figure out how you do this classic card trick. A card, freely chosen by a spectator, is signed and then torn into four quarters. The torn bits of card are wrapped in a handkerchief and then secured with a rubber band. At the command of the magician, the handkerchief is opened to reveal that the card has vanished, except for one corner. The other pieces of the card are discovered back in the deck, completely restored except for the missing corner, which is shown to match the resorted card perfectly. The marked spectator card is only partially torn, with the remaining tears made upon a dummy card. 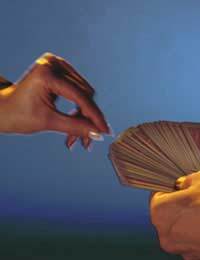 Controlling the bits of cards-as well as the spectator's perception-is the key to making the Torn and Restored Card Trick a success. A handkerchief, a rubber band, a marker pen and a normal deck of cards are all you will need to pull off one of the classic mind blowing card tricks. The key to this trick is the dummy card, which is as easy to make as tearing a playing card. Take an indifferent card and rip one corner off, which you may discard; you now have your dummy card ready to go. Place this card on top of the deck, face down, with the missing corner to the bottom left (for a left-handed grip.) Place an indifferent card on top of the dummy card and put the cards in their box. Have the handkerchief and pen handy, place the rubber band in your right coat or trouser pocket, and you are ready to begin. Pull the cards from the box, making sure to keep the missing corner of the dummy card to the bottom left as you take the deck in your left hand. Riffle the front half of the deck with your right to allow the spectator to choose a card. Once the card is chosen, place the deck face up on the table, taking the bottom card (the one that covered the dummy card) off the deck. The deck is now face-up on the table, with the dummy card on the bottom. Gesture with the indifferent card in your hand ("you could have chosen any card") and then place it face up on the deck. Take the chosen card from the spectator and tear off one corner (make sure it is the same size tear as from the dummy card). Hand the card to the spectator (leave the torn bit on the table) and ask him to sign the card. As he signs, pick up the deck of cards and turn it over, keeping the face of the cards towards the audience, as the dummy card is now exposed on the top. Take the chosen card and place it on top of the dummy card. It is important that the missing portion is opposite that of the dummy card; top right as opposed to bottom left. Don't let the audience see this. Have the spectator sign the torn bit of the chosen card. While he is doing this, you will deal the dummy card (second from the top) face down on the table- this will be easy to accomplish using your right thumb on the top right corner of the deck, where the missing corner of the chosen card gives you access to the dummy card. Cut the deck and place it face down on the table. Pick up the dummy card (face towards you) and rip it in three quarters. Pick up the signed corner of the chosen card from the table and place it on top of the packet. You can now show the front and back of the packet, which the audience assumes is all part of the same card. Cover the packet with the handkerchief while pushing up on the face of the packet with your right thumb- this will make the signed corner stand up. Grasp the corner through the top of the handkerchief with your left hand- it will look as if you took the entire packet. Palm the torn bits of the dummy card and place them in your right pocket as you take out the rubber band. Wrap the bottom of the "packet" in the handkerchief with the rubber band and hand to the spectator. Say the magic words and have the spectator unwrap the package - the card has vanished, except for the signed corner. You may now fan or spread the deck of cards to reveal a card with a missing corner - the signed chosen card, which you then show matches the torn corner perfectly. Have the spectator take and match the card for you, or even hand the deck to him to find the restored, signed card first. Putting the magic in a spectator's hands as much as possible is a great way to immerse them in the magic.